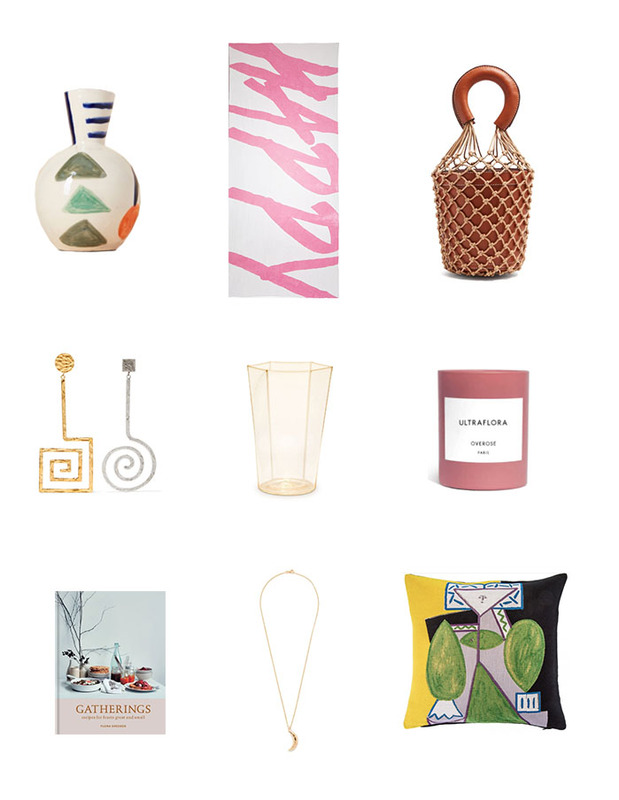 This Sunday is Mothers Day here in England and since this will be my first year celebrating the holiday (as a mom) I thought that I would put together a little gift guide for all the mums out there that love design like me! Here is a round up of special pieces that I am loving at the moment. 1 – I love the hand drawn abstract patterns on the beautiful new collaboration between LRNCE & Conran Shop. This vase is one of my favorite pieces. 2- This ‘Happy’ tablecloth is also a work of art in my eyes. This is a very special piece that any mum would cherish for years to come. 3- The bag of the upcoming season is this bucket bag by Staud. I love it so much and it would be a hit for any stylish mama. 4- Unique jewellery is always a favorite of mine. These graphic gold and silver earrings are definitely on my wish list. 5- Classic and chic. These very special gold glasses by L’Object will elevate any tableware collection. 6- These Overose candles are fun and upbeat. I love their matte pink style. Such a fun gift for mum. 7- Gatherings are what keeps family together. This is a stylish book is full of great ideas and beautiful inspiration for family get togethers. 8- Does anyone else watch “This Is Us”? (if you don’t you should). This moon necklace reminds me of the one that Jack gave to Rebecca on the show. It is a lovely keepsake for mum. 9- I am a big fan of alternative ways to bring art into your space. This Picasso cushion is so great and also a perfect way to feel inspired at home. (It also coincides with the opening of the Picasso exhibition at the Tate Modern in London – could be a great present also!). Scritto da Pierre Herme’ the Picasso of pastry Scritto da Pierre Herme’ the Picasso of pastry Scritto da darios80 Scritto da Daniele Perché marcora ritirato? speriamo nulla di grave Adesso lo sento e vi dico , certo che Robi ha una bella S….. Torcicollo pazzesco …. nulla di grave ma anche questa settimana non fa punti, peccato. Nel mio piccolissimo di quarta categoria mi è capitato una volta di giocare con il torcicollo. Non mi riuscivano i gesti del servizio e in parte quelli del rovescio (a una mano). Non mi stupisco che si sia ritirato.